I'm going out of town, away from my Mac for the holidays. I am not posting frequently enough as I first tried to, but, yeah, it's what I can. Come next year, I am going to post more about my old finished items and the ones I don't have a credit to, and of course, about freshly finished projects. Like this one. It's plain green bedroom socks for my gramma. Halloween is all about orange and black. It is the bright color that counts, not fiber content. That is the reason I knit this sweater with acrylic yarn I bought at WalMart. The balls were huge. Leftovers made this throw and still here. Because I thought "Jack-0-lantern" would be too difficult to say for my then-15-months-old-daughter, I taught her to say "Boo!" when she see a pumpkin or Jack-o-lantern. It looked she thought it was the pumpkin's name. This year, she still said "Boo!" whenever she found a Jack-o-lantern. I wonder she is going to teach that to her own child. One by one, I am going to upload my "historical" finished projects. This is a crocheted baby blanket I made while I was pregnant. The first project in the USA. I had been seeing a gynecologist in Japan for infertility treatment before my husband was transferred to his company's USA affiliate and so we moved to The Woodlands, TX. When we knew of moving, we tried just one last treatment and it wasn't successful. So, (I cried a lot and) we gave up having a baby, decided we would just enjoy the childless life together, would travel a lot. And we came to the USA. After three month, I realized something was going on me.... I was pregnant. For the first time in my life, without those pills and shots, I got pregnant. Thanks to a lot of warm support by my husband's colleagues and their family and our family in Japan, we had a happy expecting time. One day when I was shopping at Wal-Mart, I saw yarns. They were fuzzy and soft. I took the hand-out leaflet on the shelf, already thinking of substituting the color from purple to chic-yellow, and tossed those yarns, one white and two yellow, in the cart. At check-out, a lady behind me asked, "Oh, is that yarn on sale or something? How much is it?" I didn't know the exact price. I didn't think it was very expensive, and it wasn't ($3 each or so... "acrylic baby yarn price", you know), but I didn't care anyway. It finished this blanket in 3 days. And I found cotton yarns. After working with them for a while, I found crochet lace yarns and made several doilies. And.... I dug up my knitting needles from big "things for craft" plastic container a.k.a. Pandora's Box which was kicked deep in the closet. I learned how to crochet and knit from my mother when I was 8 or 10 years old, I don't really remember when. I was busy with other things and wasn't knitting nor crocheting after that "first contact." When I was 19 or 20, one day in a craft store with my mother, I suddenly wanted to knit something warm for myself. My mother bought me a set of straight needles and crochet hooks there for my birthday present, told me these needles and hooks are going to be a life-long friend of mine. I chose an olive green wool yarn and a pattern book, Mom payed for those, too. The book was a collection of lacy summer knit, but I fell in love with one cardigan in that book. I followed the pattern with a virgin's passion, so naturally, the finished cardigan was big, but because I knit the sleeves from shoulder down and stopped where my arms end, it was wearable and warm. I loved that cardigan and wore it out. After that, I knit a few sweaters for myself and for my boyfriend (now husband. Curse didn't work on me.) and crocheted scarves from time to time. When I knew I was moving to Texas and did a quick research about the temperature, I had given up knitting. I thought it would be too warm. No. No giving up, folks. There are a bunch of cotton yarns out there, and, sometimes, we have cold airs visit from Canada. 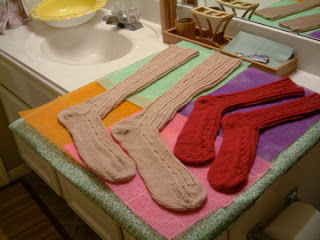 Socks are done. His is loooong because I wanted it to be "fishing socks", that means it needs to be men's size 12 1/2 boots length. I hope I didn't make it too small. Hers required just one skein, so I have one whole skein left for other project. .... I HAD one whole skein until my daughter asked for "red socks." Because she likes knee-highs, there won't be a lot of leftovers. OK, stripy socks in beige & red? This is my blocking/drying device, by the way. Under the craft (neon-colored) plastic mesh is a wood board padded with quilt paddings , covered with the biggest piece of cloth I had at the moment, glued with wood-craft glue. When I need to pin something for blocking, I use these mesh for a guide. I expect a little more air circulation with them, I don't know how much they are contributing. I could put the board out on the deck for a quick dry, but usually, it sits on the dryer or here, in the guest bath room.